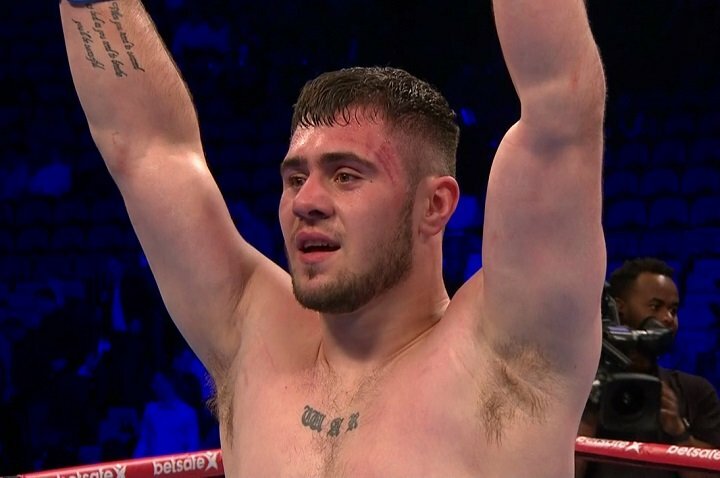 By Scott Gilfoid: Domestic level heavyweight David Allen (12-3-1, 9 KOs) apparently didn’t learn his lesson from the last time he tried to tangle with the talented Lenroy Thomas (22-4, 10 KOs) in losing a 12 round split decision to him last May, so now he’s facing him again on March 3 on the undercard of the Kell Brook vs. Sergey Rabchenko card at the Sheffield Arena in Sheffield, England. There’s the right rematches for fighters to take and the wrong rematches. This is a wrong one for Allen. He needs to be steering clear of Thomas. It’s painfully obvious from watching the previous Allen-Thomas fight that Allen isn’t equipped to win. The card will be televised live on Sky Sports. It’s unclear whether the Thomas vs. Allen 2 rematch will make it on the televised portion of the card. My guess is it won’t. Oh well. Having seen Allen lose to Thomas last year, I think this is dumb, dumb and dumb for him to be mixing it up with the tough as nails American in a rematch. It’s important for ALL fighters do know their limitations. Allen, 25, should know from the last time he fought the 32-year-old Thomas that he doesn’t match up well with this fighter. Allen was eating jabs all night long against Thomas. It was 12 rounds of pure schooling that Allen got by Thomas in that fight, and I don’t think it’s going to be different in the rematch. I don’t want to drizzle on Allen’s parade, but he doesn’t belong in the ring with a guy like Thomas. I mean, a rematch would be fine if Allen waited 3 or 4 years for Thomas to get old before fighting him again. After all, Thomas is 32 now. In 4 or 5 years, he’ll be pushing 40, and probably nowhere near what he is now. Instead of facing Thomas again, Allen should be facing someone like Tom Dallas, Dave Howe or Jason Gaverne on the Brook-Ranchenko card. I’m just saying. It’s better for Allen to be in a showcase fight against someone he can beat then it is for him to be facing a guy that has his number in Thomas. It’s too soon for the rematch with Thomas in my opinion. In the previous Thomas-Allen fight on May 27 last year on the undercard of Brook vs. Errol Spence Jr. at Bramall Lane in Sheffield, England, Thomas beat Allen by the scores 112-115, 115-113 and 114-115. Boxing News 24 had Thomas winning by a 116-112 score. It was a clear 8 rounds to 4 victory for Thomas. Allen was beaten to the punch all night long and reduced to that of a punching bag. It wasn’t as bad a beating for Allen compared to what he experienced in his losses to Dillian Whyte and Luis ‘The Real King Kong’ Ortiz, but it was still bad none the less. Allen has been doing zero since his 3rd round knockout win over journeyman Tom Dallas last year on July 22. Allen the rematch with Thomas, but it’s such a crazy idea. There are smart rematches to take and then there are the dumb ones. This has to be classified as a stupid rematch for Allen to take. He doesn’t have the TAELENT to beat Thomas, and I don’t think he ever will. It’s too bad Allen’s promoter Eddie Hearn didn’t try and talk some sense into him, because this is another bad fight for him. « Amir Khan’s best opponent?